If you are here for my Harmony Hot Pressed Watercolor Paper giveaway, you can find it here. 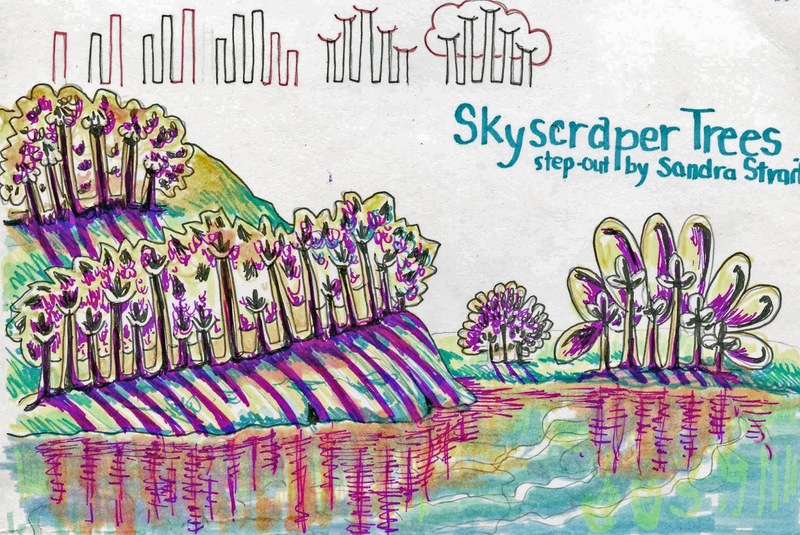 The Friday Fun & Easy Landscape Challenge June 8 – June 14: Draw a landscape using the Skyscraper Tree step-out. Extra calorie-free brownie points for throwing in some shadows. And now, I’ll both preen (made a video!) and apologize (it’s a sucky video). For my birthday, hubby gave me a wonderful new camera and I’m learning how to make …ta da!..videos. I don’t really have time to practice, and I learn better by actually doing, anyway. Trying to figure out where to put the camera so you can see over my hands and I don’t cast shadows, and then the editing software….oh! Anyway, you have a video for today’s step-out and example, for what it is worth. I chose a very simple step-out. It’s a bit like Grove, in that it’s a way of drawing several trees as one. I was doodling skyscrapers while playing Yahtzee with my mother, and that’s how I got the idea. Variety can be achieved, not only with the foliage, but by playing with the trunk width. Try adding squiggles or little windows like you would if you were actually drawing skyscrapers.